Form and survey apps help you learn about your customers, get valuable feedback, and gather whatever data you're looking for. There are dozens of capable form builders and survey apps on the market, and—unlike in many other software categories—many of the best options are free. These tools allow you to create unlimited forms and surveys without breaking the bank. Here are our picks for the best free form and survey builder apps. Not sure if what you need is technically a form builder or a survey tool? In truth, there's not a huge difference between them. Either type of app could work, so the best approach is to look at the features of each tool to find the one that best suits your needs. What Makes a Great Free Form Builder/Free Survey Builder? They let you create unlimited forms/surveys for free. Some of our picks limit the number of questions you can ask or the number of responses you can receive, but in terms of the number of forms and surveys you can create, there's no limit. They're designed for building website forms/surveys. 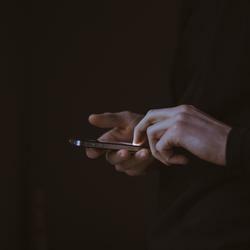 There are plenty of remote data collection tools that let you collect data using your mobile device or tablet, but we wanted to focus on tools that help you build forms and surveys that you can embed on your website. They're easy to use. Each app we selected is user-friendly and intuitive, letting you build forms and surveys quickly without having to read detailed how-to documentation. With those criteria in mind and looking for unique features that set the apps apart, we narrowed down our list to the following nine options. 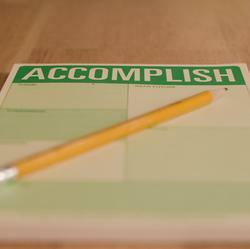 Only need to create one—or no more than a few—forms or surveys? 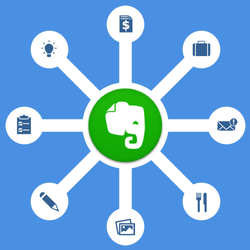 There are a lot of great apps with free plans that don't include unlimited forms/surveys. If you can't find what you're looking for on this list, discover more options in our best form builder apps and best survey builder tools roundups. 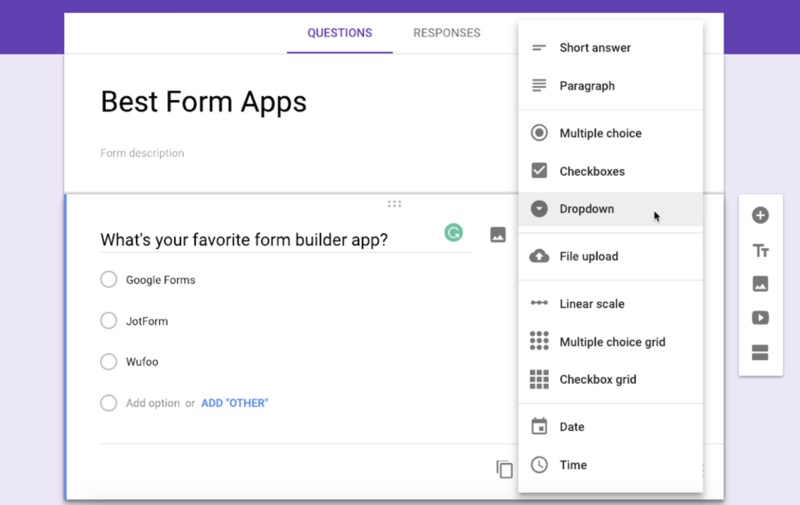 Technically, Google Forms is a form builder, but you can use it to create forms, surveys, polls, or even quizzes that get automatically graded. Collect short- and long-form questions, use linear scales to capture sentiment, or upload several images to let people choose from multiple options in a grid. Google Forms offers 11 different field types—all of the major types you'd expect in a form or survey tool. It also has simple data validation checks for text fields and conditional logic that serves different questions based on previous answers. You can't accept payments through a Google form, but you can accept uploaded files and save them right to Google Drive. If you need to collaborate with teammates on a form, you can share it with your colleagues so they can add and edit form fields too—even in real time. After your form is published, view responses as a report in Google Forms, get emails for new responses, and/or export responses to Google Sheets to sort, filter, or visualize your data in a more meaningful way. Finally, you can use Google Forms' Zapier integrations to send your form responses to the right place. Connect Google Forms and Trello to add new form responses to your to-do list, automatically add responders to your email list by connecting Google Forms and Mailchimp, or see your form responses in Slack with a Google Forms and Slack integration. If you (or your company) prefer Microsoft tools to Google apps, you may want to consider Microsoft Forms. It's very similar to Google Forms, but it collects your responses in Excel instead of a Google Sheet. Or if you prefer Airtable, check out Airtable Forms. Both Microsoft Forms and Airtable offer free plans that let you build unlimited forms. The one big disadvantage of Google Forms is that your design options are pretty limited, so if you're looking to build a unique form that matches your website's design, it's not ideal. Instead, consider Typeform—a form builder that lets you create customized and multi-page forms, surveys, questionnaires, polls, and quizzes. Typeform offers tons of templates for every type of data you need to collect. Build a form from scratch and design it yourself, or grab a template designed specifically for collecting lead information or event RSVPs, personality quizzes or employee evaluation forms. Then, refine the design with various color schemes and font choices. Build your entire form/survey on a single page, add a cover page and thank-you page, or create multiple-page surveys and forms. Then, build your form using nearly 20 question types, including traditional options like multiple choice questions and more advanced fields like question groups (e.g., 1, 1a, 1b, etc.) or picture choices. Finally, you can make the most of the responses you collect with Typeform's Zapier integrations: log new responses in Google Sheets or Excel, automatically send follow-up emails to people who fill out your form, or save a copy of each of your form responses in Dropbox or Google Docs. Typeform Price: Free for unlimited forms with up to 10 questions/form and 100 responses per month; from $35/month for the Pro plan that includes unlimited fields and responses along with logic jumps and payment fields. Google Forms offers only basic conditional logic and doesn't let you accept payment information. Typeform has more advanced logic and lets you accept payments—but only if you subscribe to a premium plan. So if you need more advanced features like these in a free form builder, Cognito Forms is an ideal choice. You can split your form up with logic sections, figure out totals with calculated fields, build repeating sections to use on multiple forms, and accept payments using its built-in integrations with Stripe, PayPal, and Square. Cognito Forms can even turn your form results into a templated PDF document so you can send a formatted receipt to your customers. All of these features are available in Cognito's free plan, minus payment processing fees if you use the form to collect payments. Forms are also relatively customizable: Insert page breaks to create multi-page forms, or edit fonts, colors, and columns widths. And like with Google Forms and Typeform, you can use Zapier to connect Cognito Forms to more than 1,000 other apps to streamline your form workflows. Cognito Forms Price: Free for one user and unlimited forms with up to 500 form entries per month; from $10/month for the Pro plan that includes two users and up to 2,000 entries per month. Unlike the other form builder apps on this list that work on any site regardless of what CMS you use, Ninja Forms is a plugin that only works on WordPress-powered sites. It offers a variety of templates for all sorts of needs: Create a basic contact form, accept job applications, or let users send data deletion requests so you can stay compliant with GDPR regulations. And while all of those features are free, Ninja Forms sells a variety of add-ons that let you do a lot more: Accept payments through Stripe or PayPal, register new users on your WordPress site, or automatically sign up responders to your Mailchimp newsletter (though you can do the same for free using Ninja Forms' Zapier integrations). Ninja Forms' form builder is easy to use and works much like other popular form apps, with options for multi-column forms and CSS styling. And you can make as many forms as you want and store as many results as you need right in your WordPress database alongside the rest of your content. Ninja Forms Price: Free for unlimited basic forms and responses; purchase add-on extensions from $29 each, or subscribe to the Personal plan for $99/year to get core add-ons and support. If you want to create a form that pops up at a specific interval or when a user takes a specific action, HubSpot's Form Builder is the app for you. Create forms that appear in pop-up overlays on click or when a user shows exit intent, forms that drop in at the top of the page after a certain amount of time, or forms that slide in on the left or right side of your webpage. HubSpot's pop-up forms are primarily designed to collect a few pieces of information, so the only available fields are email, first name, last name, and phone number (adding custom fields requires a premium plan). 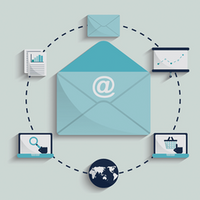 But if you're just collecting data for newsletter subscribers or new leads, that's probably all of the data you need. You can also use HubSpot Form Builder to create more traditional, non-pop-up forms, and there's much more flexibility there. 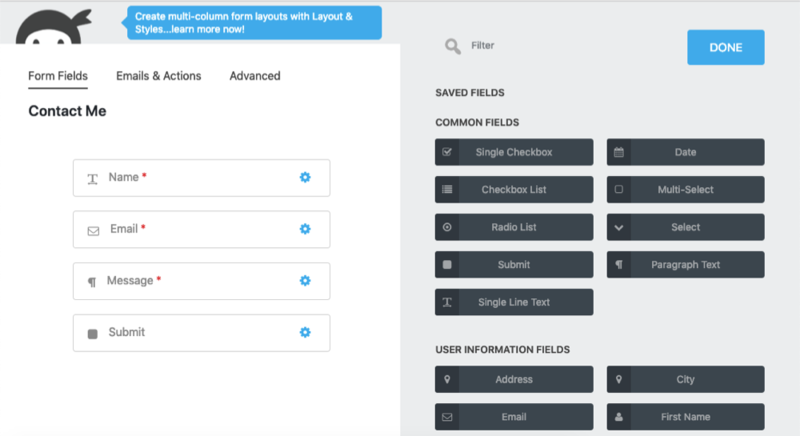 There are a few templates to choose from—mostly for marketing- or sales-related use cases—or build your own custom form using nearly 50 fields. HubSpot Form Builder is part of its Marketing Hub product which comes with a free customer relationship management (CRM) tool, and you use the CRM to consolidate details from form responses. But if you prefer to use a different tool to view and manage your form responses, you can use one of HubSpot's Zapier integrations to send new contact details to Google Contacts, Mailchimp, Slack, Google Sheets, and more. 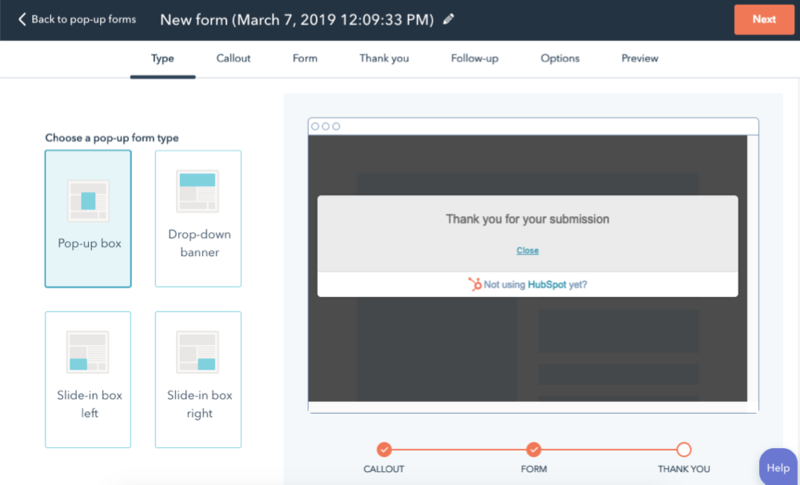 HubSpot Form Builder Price: Free for unlimited forms, questions, and responses and up to one million contacts; from $50/month for Marketing Hub Starter that includes custom pop-up form fields and lets you build forms without HubSpot branding. Crowdsignal (formerly Polldaddy) is an excellent tool for building simple, one-question ratings surveys and polls. For example, say you want to let your readers rate a piece of content published on your site. 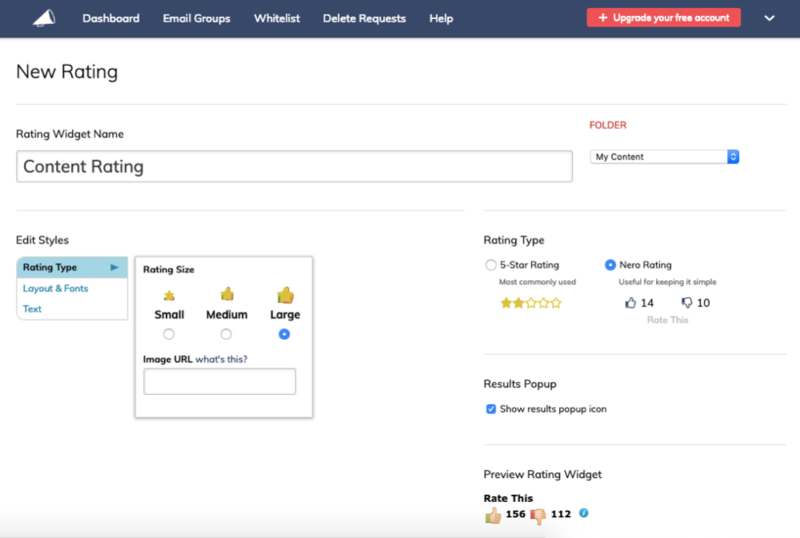 Use Crowdsignal to build a rating poll, choose between star ratings and Nero ratings (thumbs up/down), choose the size of your icon, and add text. Then, embed the widget on your site to start collecting ratings. You can also use Crowdsignal to create single-question polls using either text or image multiple-choice responses. Allow people to enter their own answers, select multiple answers, or choose only a single answer. Crowdsignal polls can even include Facebook and Twitter sharing buttons that make it easy for people to share your poll on social. 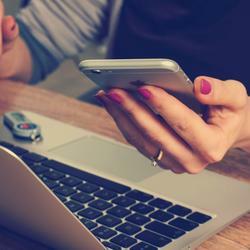 If you need a more detailed survey or quiz, you can create those in Crowdsignal, too. Build full-length surveys with multimedia embeds and HTML snippets, validate responses, and close surveys automatically after a certain date. Choose from 13 field types to build your survey, drag and drop questions to reorder them, or create multi-page surveys with conditional branching. Crowdsignal Price: Free for unlimited polls and surveys, though polls may be rate limited for excessive votes; from $29/month for the Pro plan for up to two whitelisted polls, advanced reporting, and priority email support. Most of the survey builders on this list limit the number of responses you receive to 100 per survey. SurveyPlanet stands out because its free plan puts no limit on the number of surveys you can create, the number of responses you can collect, or the number of questions you can ask, making it an ideal tool if you anticipate getting lots of responses to your surveys. SurveyPlanet makes it easy to build surveys. You don't even have to write your own questions. 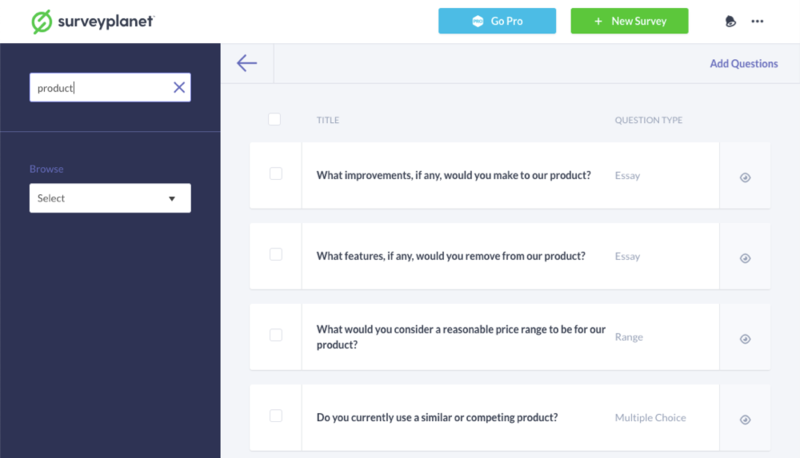 For example, if you're trying to get product feedback, type product into its questions template search bar to see tons of pre-written questions you can grab and use in your survey. 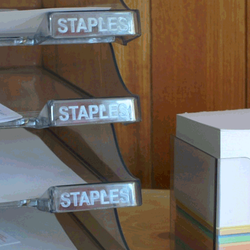 It's a great way to avoid writing leading questions and to build a survey quickly. If you want to tweak more, SurveyPlanet lets you do that, too. Choose between a variety of themes that control your survey's color scheme, or have your questions display one at a time or all at once. The only downside is that you'll need to upgrade to export your survey results—but if its built-in reports are enough, SurveyPlanet is an excellent free option. SurveyPlanet Price: Free for unlimited surveys, questions, and responses; from $20/month for the Pro plan to export survey results or build custom themes. There's no limit to the number of surveys you can create or responses you can receive in SurveyPlanet, but when it comes to volume of pre-written questions, SurveyMonkey has it beat—hands down. Type a keyword into its Question Bank search bar to get hundreds of results for pre-written questions, then click questions you like to add them to your survey instantly. The downside: The number of questions you can ask and responses you can collect on SurveyMonkey's free plan is limited. You can only ask 10 questions and collect 100 responses per survey, and you'll have to upgrade to customize the design of your survey, add a logo, or export your results. However, with one of SurveyMonkey's Zapier integrations, you can send results to Google Sheets or Excel automatically, even if you're on the free plan. In addition to its large library of pre-written questions, SurveyMonkey also provides one of the best mobile survey experiences. Each question has plenty of white space above and below it, the buttons are large so they're easy to click, and a step indicator lets respondents know exactly how many more questions they have to answer at each step along the way. SurveyMonkey Price: Free for unlimited surveys, 10 questions/survey, and 100 responses/survey; from $37/month for the Standard plan that includes unlimited questions, up to 1,000 responses/month, skip logic, and data exports. Though it's technically a survey tool and not a form builder (Zoho has a separate product, Zoho Forms, designed specifically for building forms) Zoho Survey rivals Google Forms for most flexible survey and form builder. It has pretty much everything you need to create either detailed forms or simple polls and surveys, all with more options than you'll get in Google Forms. 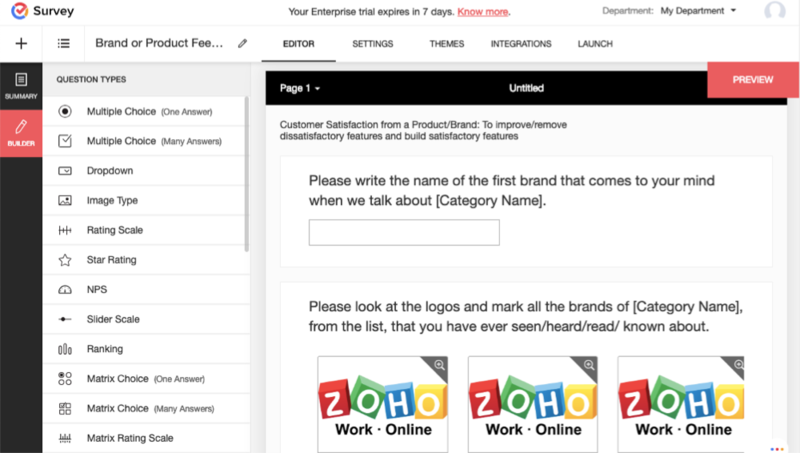 To start, Zoho Survey lets you add more than 25 question types, including things like Net Promoter Score, ratings, and drag-and-drop rankings that Google Forms doesn't offer. It also offers pre-written questions like SurveyMonkey and SurveyPlanet, though Zoho Survey's questions are only available as part of their themes and can't be individually selected. The only downside is that there's a limit to the number of questions you can add and responses you can collect in Zoho Survey: 10 questions and 100 responses/form. And while you can access responses in Zoho's app or export them as a PDF, you'll have to upgrade to download them as a CSV or XLS file. 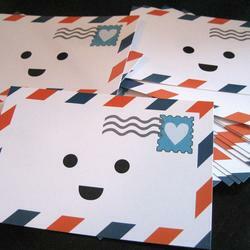 But overall, it's a flexible tool that could be perfect if you don't expect to get hundreds of survey responses. Zoho Survey Price: Free for unlimited surveys, 10 questions/survey, and 100 responses/survey; from $29/month for the Plus plan that includes unlimited questions, 3,000 responses/month, and CSV and XLS exports. One of the big downsides to most of the free survey builder apps is you have to upgrade to download reports in spreadsheet format. If you're not willing to pay for a premium subscription but prefer to have your results in a spreadsheet, you can use Excel Online to create a survey in Excel that collects your results directly in your survey—and if you have a Microsoft account already, it's free. Open a new spreadsheet in Excel Online, click Insert in the toolbar, and select Survey. Give your survey a title, add your questions using seven different response types, and decide whether or not to make questions required. When you're finished, click Save and View to preview your survey, or click Share Survey to grab a link to share with others. Each of the tools on this list makes it easy to create and share forms and surveys, so how do you choose the right one? 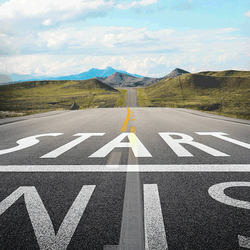 It boils down to what features are most important to you. If you need to create lots of form/surveys and accept unlimited responses, choose Google Forms or Survey Planet. If you need help writing questions, you'll probably have the best luck with SurveyMonkey. If you want something simple, Crowdsignal could be perfect, but for more advanced capabilities, choose Cognito Forms or Zoho Survey. 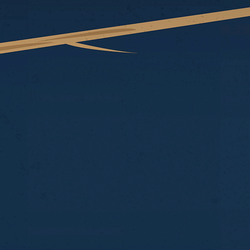 The best part: Since all of the tools are free, you can try as many as you like before choosing one to use long-term. Originally written in September 2017 by Matthew Guay, this post has been updated with each app's latest features and pricing, as well as new tools like HubSpot Form Builder, SurveyMonkey, and Zoho Survey.